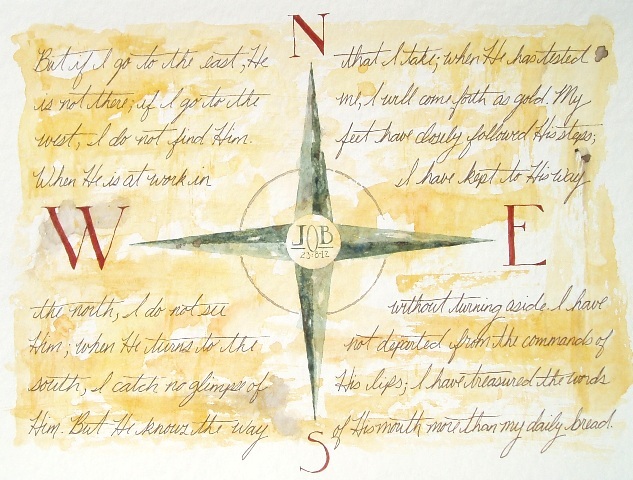 This is a chunk of scripture I memorized a while back and a painting I did to go with it. I love how scripture uses little words to make big statements. Notice that the passage tells me that I may not see God, hear God, or feel God – there may be absulutely no evidence of Him around me at all. Ever felt like that? I have. Then He uses a little bitty word that negates, or makes small, everything before it. He uses the little word ‘but’… “But He knows the way that I take…”. God wants me to know His eye is on the sparrow, therefore His eye is on me. He knows every step, every eye lash, every tear – He knows me intimately. He is my Creator. He knit me together with His own two hands in my mother’s womb and then with those same two hands, was nailed to a cross for my sins. Man alive, I serve a marvelous God! This one is very creative and eye catching! I love it!